Successfully Added Professional Printing 3D Pen with OLED Display - 6mm Nozzle, Different Speeds + Printing Temperatures, ABS Filament (White) to your Shopping Cart. From the same manufacturer that made the MYNT 3D pen comes the Professional Printing 3D Pen with OLED Display. The same high quality build, and attention to detail but at a fraction of the price. This 3D printing pen allows you to create stunning 3D art, sculptures, and drawings instantly. No longer will you be limited by your imagination as this stereoscopic pen truly allows you to let your thoughts come to life. Featuring an extremely slim design, this 3D pen forms a comfortable fit to your hand. Along with its large buttons, this handheld 3D printing device lets you easily operate your printing speed and temperature by the touch of a finger. Coming with a high-quality OLED display, the pen will constantly keep you updated about your current printing speed and temperature – ensuring that you’ll always have the right settings enabled to create the finest 3D art and sculptures. Just as any regular pencil, this stereoscopic pen allows you to draw anything you wish. What sets this 3D pen apart from a regular pencil is, however, that instead of ink it uses an ABS filament that dries and hardens instantly – allowing you to create touchable 3D objects. Coming with three strings of ABS filament, this 3D pen is ready for use straight out of the box. Additional ABS filament can always be added, allowing you to create 3D figures and fine arts in all the colors of the rainbow. Supporting different temperatures and printing speeds, this 3D printing pen is guaranteed to suit the needs of all artists out there. Along with its slim design, this stereoscopic pen features a high-quality 6mm nozzle. Not only does this nozzle offer a stable fit to your hand, it also provides protection against the heat generated while printing the ABS material. 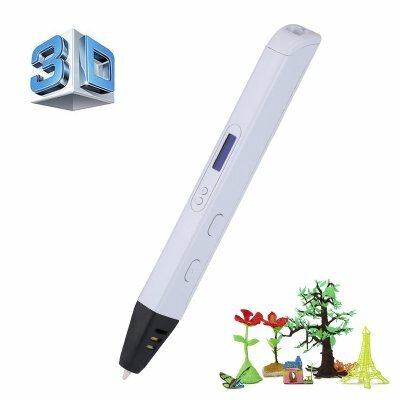 Thanks to its comfortable deign, this 3D printer pen is easy and safe to operate for youngsters and professional artists alike. Simply plug in the power adapter and you’ll be all set to create 3D art from scratch and let your imagination come to life whenever you want. Whether you simply like to follow a paper template or draw your own 3D sculptures – this cool electronic gadget provides you with all means necessary to turn all that you can imagine into touchable 3D art. Being suitable for any level artist out there, this stereoscopic pen is the perfect printing tool for hobbyists, professional artists, and students alike. Not only does it provide you with handheld 3D printer that allows you to create stunning 3D art and sculptures, it additionally forms a cool electronic gadget used for educational purposes. With this 3D pen, nothing but your imagination limits you in creating that what you’ve always dreamt off. This stereoscopic pen comes with a 12 months warranty, brought to you by the leader in electronic devices as well as wholesale electronic gadgets..
Arabic: - القلم الطابعة ثلاثية الأبعاد - Chinese Simplified: - 3D 打印机笔 - Czech: - 3D tiskárna pero - Dutch: - 3D-Printer Pen - French: - Imprimante 3D Pen - German: - 3D Drucker-Stift - Hebrew: - עט במדפסת תלת-ממד - Hindi: - 3 डी प्रिंटर पेन - Hungarian: - 3D nyomtató toll - Italian: - Stampante 3D penna - Japanese: - 3 D プリンターのペン - Korean: - 3D 프린터 펜 - Malay: - Pencetak 3D Pen - Norwegian Bokmål: - 3D-skriver penn - Romanian: - Imprimanta 3D Pen - Russian: - 3D-принтер перо - Spanish: - Impresora 3D pluma - Thai: - ปากกาเครื่องพิมพ์ 3D - Turkish: - 3D printerlere harcama maddeler kalem - Vietnamese: - Bút máy in 3D.